I launched from the Orondo Street boat launch Sunday morning at 6:30. It was a calm morning with a little overcast. The clouds had thrown a thermal blanket over us to trap the heat in from Saturday’s beautiful, fall sunshine. I felt almost overly warm in the sweatshirt I had donned to launch the boat. I used my small, 10-horsepower trolling motor to get away from the dock so I could let other boats lined up launch too. Once out in the river, I noticed there wasn’t much flow. I figured I’d be using the trolling motor to troll both up and down stream today in this placid pool. A few grinds on the main motor later and I was powering my way upstream. It felt good to be out again. It had been several weeks since I’d tried these waters on my boat. I was happy not to be blurry-eyed from staying up too late the night before. I had turned down hockey tickets and suds-soaking at a local tavern to get a good night’s rest. I was determined to finally land a fish. Skimming across the water, I scanned my fish-finder in the early morning light for a depth. 35-feet deep. At the Wenatchee Row and Paddle Club’s dock, I angled the bow across toward the east shore of the Columbia. Watching closely, my depth reached as shallow as 12-feet in the middle of the river before it finally dropped into another 35-foot channel on the other side. I was on the bottom end of the channel I’d schemed to fish the night before while standing in my kitchen, tying hooks while watching TV. I turned the main motor off and lowered the trolling motor. It had been a challenge in my 20-previous trips. It seemed the God’s had cursed me one time after another with something different going wrong. These murky thoughts swirled through my mind as I pulled on the rip cord of the 10-horse Honda. To my delight, the motor caught and purred to life within half a pull. I attached the steering arm to the main motor and kicked it into gear, aiming the bow upstream. I opened my tackle box and remembered to put my gloves on to maintain a sterile, non-human smell as I loaded the Brad’s Super Bait (Mello-Yellow color) with Graybill’s Salmon Sauce and tuna canned in oil. I dropped the smelly concoction over the side and watched it dance behind the silver flasher in the water. “I’d bite that if I were a salmon,” I mused. I let out 17-pulls of line and then hooked it to the downrigger snap. I put the rod in the pole-holder and loosened the drag just enough so it would automatically unspool as I let the downrigger ball down to 17-feet deep. I was fishing. And it was 6:45am. I’d dropped with the downrigger on the starboard side of the boat. Normally, I’d put the pole opposite the steering wheel so I’d be able to sit in the seat and watch it easily, but today was my first day using the Scotty downrigger Dad had loaned me. I figured the weight of the downrigger on one side of the boat would balance out the trolling motor attached to the other side of the stern. I glanced around the river and noticed I was fishing this stretch of river alone. A group of boats were fishing downstream of Walla Walla Point Park in the channel off 5th Street. Another wad of boats was upstream of me hitting the upper end of the channel I was fishing. And then the majority of the boats were fishing right off Walla Walla Point Park, many of which anchored. I figured they were probably bobber and shrimp or jig fishing for steelhead. I’ve caught more than my fair share of salmon in the past. Growing up in Western Washington, I cut my salmon teeth fishing Puget Sound for Blackmouth, Chinook, Coho and Pink salmon. I’d plied the Lower Columbia for sturgeon below the Astoria Bridge. I’d also had plenty of success fishing salmon and steelhead on the Upper Columbia, but it was always with someone else. I had bought the open-bowed Mirage from my sister over the winter and had tried, and tried and tried to “hook” up this summer on my own. It had just never happened. Until this day. I reached around behind me along the gunnel and grabbed the net and placed it in the corner of the stern. I was almost working on instinct or out of a dazed repetition, not fully comprehending that I’d finally hooked a salmon fishing my new boat in the Columbia River right in downtown Wenatchee. I finally got a glimpse of the fish about the same time it glanced at me and took a nose dive toward the bottom, pulling line off the drag with every powerful kick. Again, I turned its nose around and brought it up to where I could finally see it for the first time. “Holy (bleep)! That’s big!” I surmised. I looked down at my net and back at the fish and also quickly assessed that my net wasn’t big enough. I held the rod with my right hand, gave it a few more reels, trying to lift just the salmon’s head above water. I raised the rod high into the air and back toward the opposite side of the boat. With my other hand holding the net, I quickly dipped the leading edge of the aluminum hoop under the salmon and allowed the rod tip to go down as the salmon went head-first into the folds of the net. I quickly went to my knees, dropped my rod and reached over the side, grabbing the net and salmon and all and heaved it over the side. Now thumping violently on the deck of my boat was the most beautiful fish I’ve ever seen. Not quite prepared, I searched around and found my other pole holder and gave it a good thump on the head. I stood up to catch my breath and take in the scene. Half the salmon lay in the net, the tail lay out, quivering. I couldn’t believe it! It had been a long summer that had now slipped into fall. It had been a summer that tested my metal as a fisherman. I considered even selling the boat and giving up my plight. But now, here on the floor before me lay my quest. I guessed it to be 18-to-20 pounds. I took my sandwich and soda out of the cooler and placed the fish into it. It didn’t fit. The tail hung out the side. “That’s OK,” I thought, “it’s mine!” When I got home later that morning, I hung the salmon on my fish scale and it weighed in at 23-pounds. Cleaning it, I learned it was a female and awarded me two, large skeins of eggs which I’ll cure and use for steelhead fishing. I’m glad I didn’t sell the boat. I’m glad I kept at it. And even though this fish was worn out from the thousand-mile swim up the Columbia to find my hook, it was the prettiest fish I’d ever seen. And, you can bet I’ll be back out again to drop a hook in the channel along the Columbia River through Wenatchee outside the heavily foliaged tree, trying to find my next fish for my boat. The author lives and works in Wenatchee, WA as Director of Marketing for the Wenatchee Valley Sports Council. 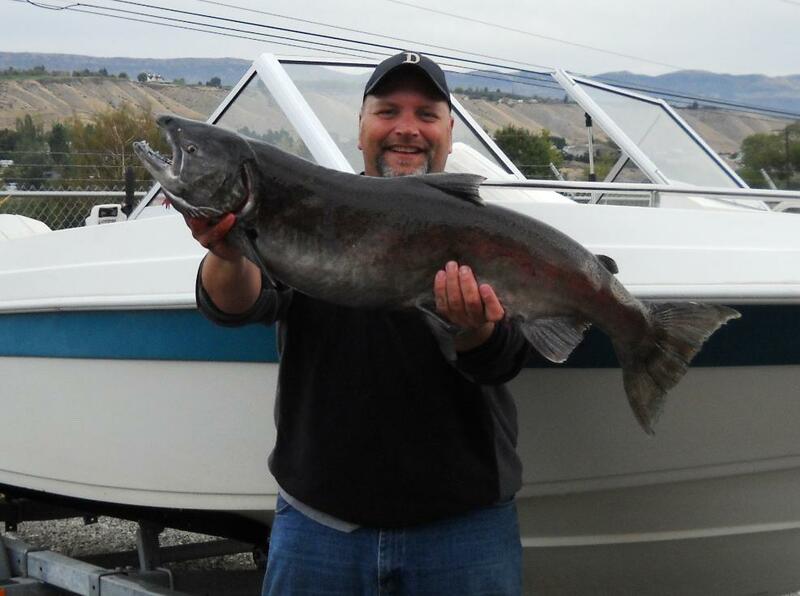 He’s an avid fisherman, hunter and outdoorsman whose articles appear periodically in the Wenatchee World newspaper and The Good Life magazine. This entry was posted on October 5, 2010 at 4:20 pm and is filed under HEADLINES. You can follow any responses to this entry through the RSS 2.0 feed. You can leave a response, or trackback from your own site.